Painted in 1983. Restored in 2002. Restored and enhanced in 2014. This immense mural is based on figures from the Native past and present in this area. 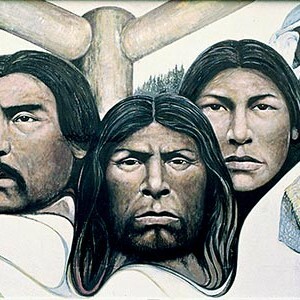 Carved poles flank the central images of (left) Ce-who-latza, who was Chief of the Lyackson Village on Shingle Point, Valdes Island, as well as a constable of the Native Police and a Native pilot for the Royal Navy; (centre) former Chemainus Band Chief Clay-sa-luke; and (right), a Salish woman. One of the other figures is Mary Rice, top right. A dozen bands of Cowichan people, part of the Coast Salish language group, occupied the Cowichan and Chemainus Valleys for many hundreds of years before Europeans came to settle the area. Here they developed the rich heritage and superb artistic traditions which they maintain today. Many descendants of these first people continue to live in and around Chemainus.